Google offers a hardly comprehensible and understandable variety of services and apps. It seems to me that if somebody has something in his mind Google brings it to the public and does not say NO like Apple does when trying to limit capabilities to the needs of it’s customers. There are different opinions about these two completely different strategies. A little bit more ‘what users want, need, and are able to manage‘ would be a step forward for both companies. Wrong concepts cannot be healed by an ever increasing number of FAQ pages. So the most important point is a consistent integration of services into a limited number of apps or web pages with equal functionalities and user interfaces. Tablets are massively gaining popularity and it’s annoying to see some options in an app developed for tablets and others which are only accessible via a corresponding website. It’s not enough to turn an app into an eye catcher and abandon the consistency between functionalities available on websites and tablet apps. This is a noteworthy discrepancy. Google is the only big company massively involved in social media and with it’s Android OS in development of mobile devices as well. Admittedly we are in the middle of a transitional phase from computers to tablets but who else should be able to bridge the gulf between both eras if not Google? Success is not a question of more complexity but of following the KISS principle. The KISS (Keep it simple, stupid or Keep if simple and straightforward) principle states that most systems work best if they are kept simple rather than made complex; therefore simplicity should be a key goal in design and unnecessary complexity should be avoided. There is no need for more than 200 options to control access to social media and response from connections. Ever growing capabilities might be useful in sector specific software like SAP enterprise applications or Microsoft Dynamics which are daily used and managed by professionals. But the overwhelming number of people engaged in social media just want an easy-to-use communication platform and clear notifications if their behavior is faulty. G+ combines the best features of all social media systems and is not bound to any special content or media type. There are highly interesting communities with sophisticated content. The strongest competitors …Twitter is just a notification system. Twitter accounts only contain pointers to content. G+ is far away from the ordinary bubbles on Twitter, which are contentless per design and just a forwarding system like SMSs with an automated distribution list. In so far it’s one of the worst system to organize information because it’s completely unstructured. Admittedly there are strong benefits when it comes to spread important information all over the world e.g. information about the Arab Spring. Facebook allows content management but it does not really allow to structure and summarize content you are interested in. Many other well-known SMs are limited in their targets or there is no suitable app for iOS devices available. Summarized we can say that Google implemented an outstanding social network concept with communities, rules for communities, circles, and moderators. But this is just the first, although essential step. Since months there are no improvements when it comes to push the daily activity into this concept. Moderators do the job in their leisure time. So they should get a maximum of support by the owner of a social network. But at the time they do not get the necessary support to do their work with an acceptable effort. To assess posts and then to decide about any necessary action against a member it needs some stats to identify repeated misbehavior and to differentiate between new and experienced members. Moderators should not earn their living from driving websites related to a community’s main topic. They will try to avoid post removals are bans because they don’t want to be seen as authoritative people with possible consequences on their business. Moderators should behave as teachers. Registering for a social network is a quite easy procedure. Reading guides about it is what the majority of people won’t do. Retrieving relevant information is mostly limited to quick guides containing feature descriptions. It requires some more to get a great member in a community. So moderators have to advise members if misbehavior is recognized. They can do it by notifying members with text templates. 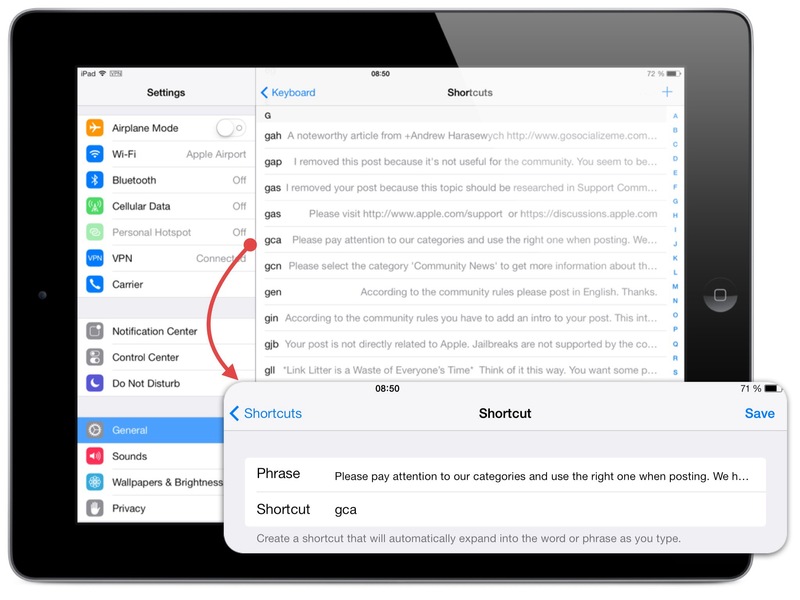 When using an iOS device there is a suitable way to notify members by using shortcuts. Shortcuts can be defined in Settings – General – Keyboard – Shortcuts by entering a phrase (the text) and a shortcut (a combination of some characters). Entering a shortcut in a text field and pressing the Space Bar lets the shortcut expand to the complete phrase. All my shortcuts for moderating start with a G followed by some mnemonic characters. You are a *TROLL*. You are obviously missing the point that this is an Apple related community. Move over to other communities to place your comments. Please *STOP* this behavior or you will be BANNED. Neither Google nor this community needs people like you. Please pay attention to our categories and use the right one when posting. We have more than 60k members and they should see just related topics when choosing a category. If you want a discussion it can be done in the comment section of every category. Thanks. Shortcuts defined on one iOS device are synced across all other iOS devices with the same Apple ID. Moderating a community dedicated to the brand Apple with more than 60k members is a hard job because emotions of members come up with the same frequency as the frequency of their device’s processors. I do this job since some months and here are my suggestions to increase support for the scapegoats (aka moderators) of a community. Feel free to DOWNLOAD this concept map in PDF file format. As long as Google doesn’t provide useful stats about actions taken on posts, moderators will still have much work by always looking at the member’s profile and trying to get more information. This is what moderators cannot do in their leisure time. So their decisions are mostly ad-hoc decisions usually not based on the individuality of the member. would help to treat members in a fair way by using individualized notifications. Clearly defined community rules and stats for moderators about activities of members as well as moderators are indispensable to let moderators decide about posts in a fair manner. For new members notifications should be friendly with an added link to a comprehensive member guide like that of Andrew Harasewych, Community Member Guide. Andrew is the owner of the G+ community ‘Social Media Strategy’ with a great reputation. If stats show that the member repeatedly failed a ban maybe considered if he cannot bring forward any arguments after being notified. Many moderators do their job on mobile devices. So features which are available on websites should also available within the mobile app. Re-categorization of posts can only be done on a desktop. The feature is neither available in the G+ app nor can it be done with mobile browsers like Safari or Chrome. Moderators have to remove the post, notify the member and he has to post again. Google should provide a frame for community rules so that members are not faced with completely different looking About sections. Regarding general rules Google should automatically add a useful link to every About section of every community. Moderators always should be engaged contributors and commenters. By writing comprehensive comments and contentful posts they should be a shining example for members. Google has implemented an automated spam detection system to identify unusual posting patterns, duplicate, low value and thin content. This spam detection system works quite well. Any posts or shares to communities which possibly include links to sites with malware or maybe non-trusted merchants are flagged immediately, invisible to any community members but moderators. Another reason something would be marked as spam is because moderators previously marked it as spam. Persistent messages from the same user, identical text, stuff like that. Moderators should always report bad content in communities as spam! The more they report, the better the automatic spam detection will get! 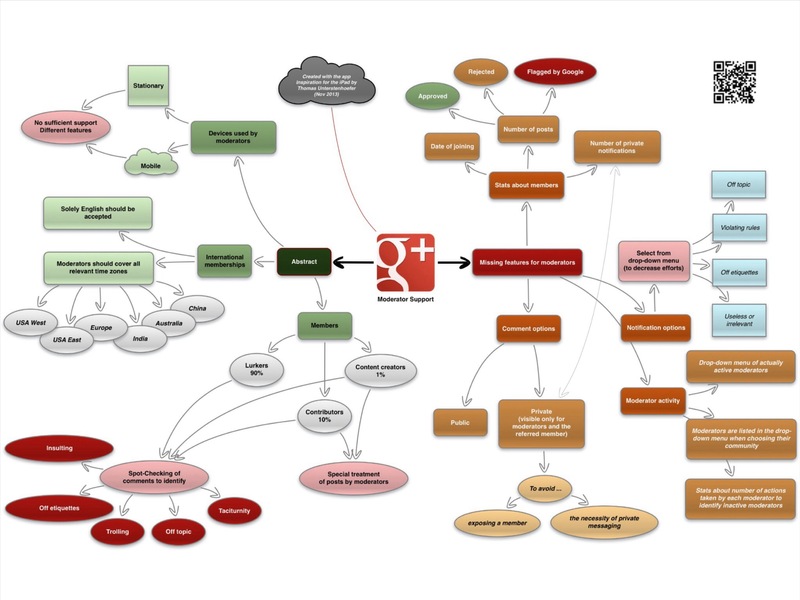 Google+ also works to analyze patterns and predict what types of messages are fraudulent or potentially harmful. This includes the typical spam language that we see daily, (adult, get rich quick, mail-order brides) or perhaps messages from accounts or IP addresses that previously sent reported spam messages. 1 Identical or substantially similar posts shared or reshared with multiple communities are more likely to be flagged as spam, especially if they are shared/reshared within a relatively short period of time. To avoid this, I recommend never sharing similar material to more than three communities within about a two-hour period. 2 Posts which contain only links or links with only a minimal amount of additional information (also known as “link litter”) appear to have a higher probability of being flagged as spam. Such posts violate the rules in many communities. As an aside, there are also strong indications that posts like that also have an extremely low click-through rate. 3 Posts which are identical or similar to posts that have been removed from multiple communities for violating the communities’ rules appear to have a higher probability of being flagged as spam. It is extremely important to become familiar with the community rules before posting because the rules vary significantly between communities, and a pattern of violating the rules in some communities might affect your posts to other communities. 4 Posts which are reshares of non-community public or private posts which were reported as spam appear to have a higher probability of being flagged as spam. Note that selecting the option for email notification when sharing non-community posts can lead people to report the posts as spam because many recipients do not appreciate the unwanted emails. You should virtually never use that option unless people have asked to be notified by email. 5 Posts by individuals who have previously been identified as spammers by the spam filters have a higher probability of being flagged as spam. If you get indications that your posts are being flagged as spam, it is best to review and change your posting habits promptly. The longer you persist in the same behavior, the longer the spam filters appear to treat you as a spammer. In serious cases, it can even lead to your account being suspended or revoked. Google has to improve the support for moderators to let them keep the quality on a high level and to prevent that this great network moves into the wrong direction. Moderators play the essential role in a concept based on communities. They cannot do their work effectively without further support by Google. Additionally Google has to improve its mechanism to identify spam. There are still many cases where posts are not flagged but obviously spam. Thanks for dropping by wherever you came from.